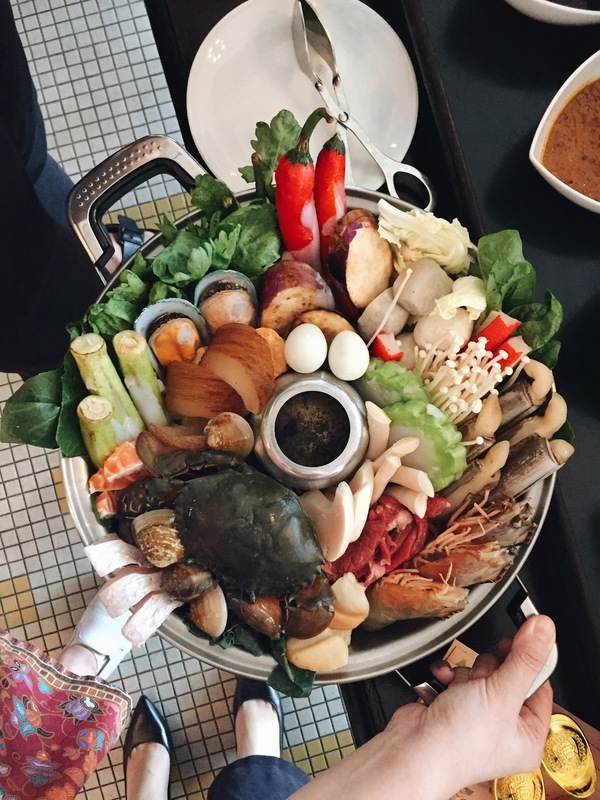 It's the time of the year to have steamboat for at least 2 consecutive days! So Chinese New Year is coming sooner than you think and I haven't gotten any bright clothes for Day1. Pretty much screwed cause if you know me well, my wardrobe consisted with only black, grey and blue. Well I have some green and pink too but they're not meant for house visiting. wet market to get their steamboat supplies which could be a real pain. died as my aunt was just too tired of all those preparation. So if your family has the same issue that mine has, fret not cause here's a saviour! I'm already sold when I saw the crab and salmon! Not kidding, I could be satisfied just by refilling my plate with salmon over and over again. My odd behaviour aside, you'll be spoilt at this buffet spread as there are 25 seafood dishes alone! bamboo mussel, prawn, sea cucumber, clams and more! All the meat for carnivores like me! The only thing that's lacking is pork but I can definitely live with that. Don't forget your veges too okay? As well as mushrooms and moderate carbs. They have udon here! Look at all the condimentsss! 13 of them to be exact! There are desserts too, doesn't Chinese tea chiffon cake sounds exciting to you? RM129.60nett per adult and RM64.80 per child. bring you family here for a merry prosperity time!